Some have not shot the CZ 75 B and others have not even heard of it. The “B” stands for firing pin Block which stops the firing pin from moving forward if the pistol were to be dropped. You should shoot it to see for yourself how unique and special it is. Several say it is the most popular 9mm design and the most copied 9mm in the market today. Others have told me it is the best all steel 9mm they have shot. Well, those are bold statements, so I want to analyze, test and evaluate it for myself and share my opinions about it with you in this review. 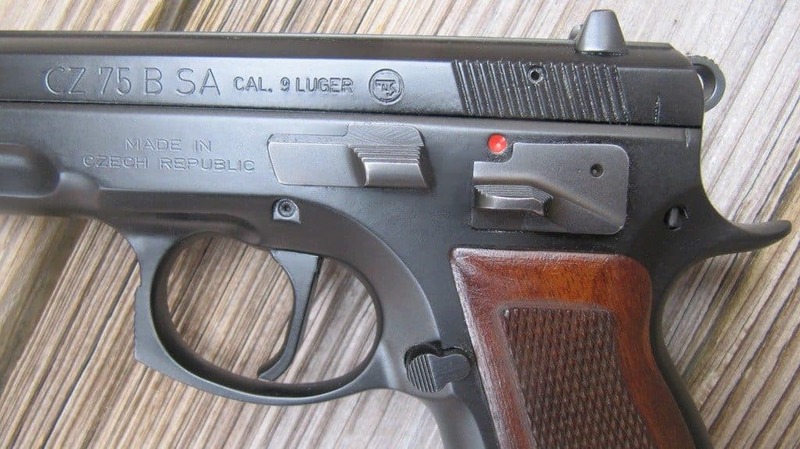 The Ceska Zbrojovka (CZ) 75 is one of the original classic “Wonder Nines” and is CZ’s flagship model. It is currently manufactured in and was first introduced in the Czech Republic in 1975. I will always remember that, since that is the year I received my doctorate degree. 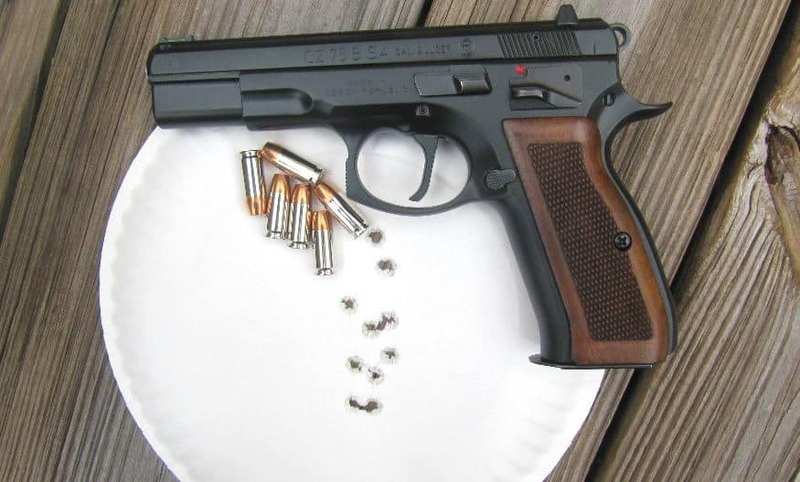 The CZ 75 B features all steel construction, a high-quality hammer-forged steel barrel, a very comfortable grip and angle, quality detailed construction, a staggered-column, high-capacity magazine, and is a very tightly-fitted gun. The CZ 75 B is used by more governments, militaries, police and security agencies than any other pistol in the world. I discovered that there are over 35 variants of the CZ 75 and over 20 very similar clones of it. I like single action guns, so I got the single-action only CZ 75 B SA version to test and evaluate. I wondered about the trigger press. The CZ 75 B SA is identical to the CZ 75 B in all aspects, except that it has a single action trigger, which is a straight-blade type and is adjustable for overtravel. 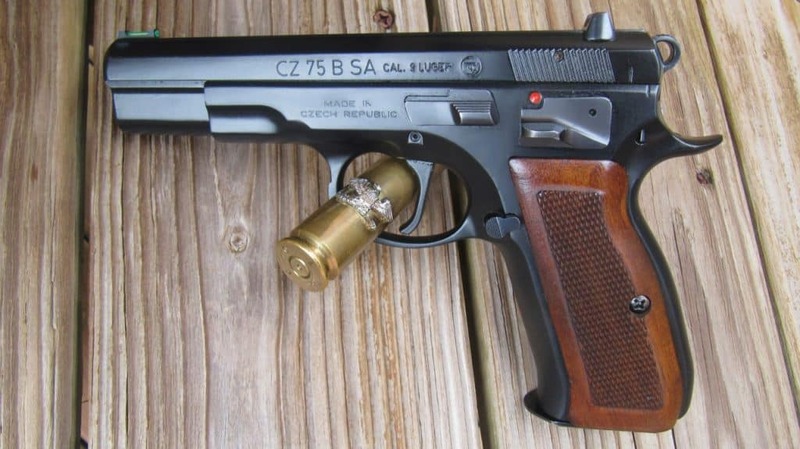 In this review, I want to give you my honest opinions about the CZ 75 B SA. First above, I gave you its specifications and features in a summary chart. Then below I’ll list my specific criteria, then compare each criterion to the gun’s characteristics and features, and lastly show my range live-fire test results to help you analyze and compare it to your own criteria and desired features. You can add or subtract from my criteria to meet your needs and preferences. Know that I am not on the CZ-USA payroll, have not been paid by them for my review, and have not been influenced by them in any way to say certain things about the gun. I want to pay the retail price for the gun without any price concessions for it. I want to be honest and straight-forward with my opinions and ideas the way I see the pistol to sincerely help folks. How accurate is the pistol? Is it really as accurate as folks have told me? Is the trigger press continuously less than 5 pounds press weight, as measured for several readings by my trigger pull gauge? Is it reliable for me in this brief test after shooting about 200 rounds of various ammo? Is the external safety, slide stop and/or mag release ambidextrous and does it freely release mags? 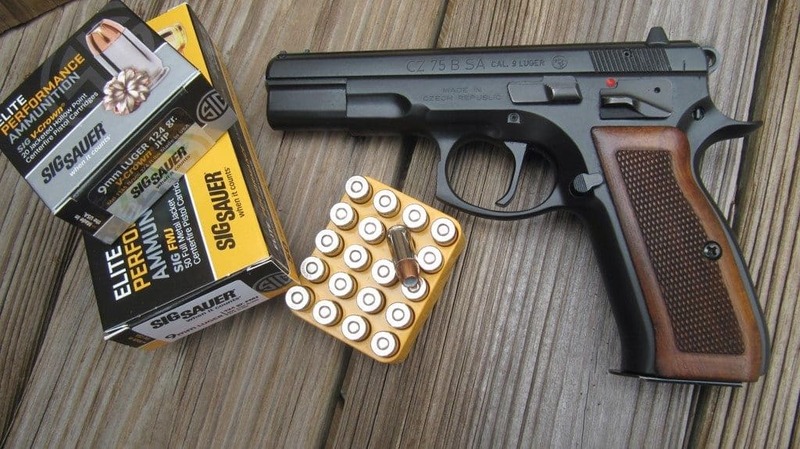 Do I recommend this CZ 75 B SA for concealed carry, home defense, recreational plinking, and/or competition, etc.? Below are my 10 criteria that I use to evaluate all guns. As always, set your own criteria and priorities, do your own research and check my data, information, etc. with yours, for your very personal selection process. Here are just 10 of my criteria and factors I use for evaluating any handgun, so I will use them for the 75 B SA. In addition to my criteria, there are other subjective features that may be appealing for some, like smooth rounded corners, ambi mag release, action, caliber, appearance, number of mags included, type of sights/modifications, bore axis, rail, grip angle, included extras like a holster and pouch, customer service, etc. So, I combined these into my last Miscellaneous criterion. I must admit that ALL gun-choice decisions involve tradeoffs, but I really want ALL of my criteria to be met. I assigned a total possible point score of 10 points for each of my 10 criteria for a total possible score of 100 points. You can certainly add your own additional criteria and preferences or subtract any of mine. In deciding, you make your own tradeoffs according to your personal goals, priorities, preferences, needs, and use, but take a total system perspective and recognize that there are several overall features, characteristics, and pros and cons to include and then consider them. Since I was getting ready to leave the country for business, I had time to only fire about 200 rounds to evaluate this gun (usually I shoot 500 rounds over a couple of days) to decide if I want to use it for personal protection or not or for what purpose. The ammo worked very well and I did not have any malfunctions or stoppages. I was pleased with the performance of the Sig premium V-Crown and Elite ammo. I really like the overall ergonomics on this gun. The gun felt very good in my medium-sized hands, was comfortable, and the added custom wood grips were just right for me. You probably want to change from the standard polymer grips to some sort of custom grips. This is the only change I would suggest initially, until you have more range time with the gun. There are several features I like on the 75 B SA 9mm. The durable polycoat on the frame is very strong and I did not get any scratches at all on the gun with heavy use at the range. Although it is heavy, as an all-steel gun, the upside was that it was very accurate since I did not move that much from its heavy weight. My felt recoil was very little with this 9mm beauty. Maybe you can partially judge a gun by its looks. The nice grip angle, upswept beavertail, steel barrel, and quality build made the gun feel great and it performed equally as well. The gun was heavy after a week or so of carrying it, however, so I would not recommend this full-size gun for carry purposes unless you have a very strong belt, holster, and the build to handle it. For occasional concealed carry, it would work fine as a gun among your others in your rotation, with a quality and sturdy belt and holster. Because of its great accuracy out of the box and its ergonomics, I would be tempted to carry it. This SAO pistol does have an ambidextrous manual safety for cocked and locked carry like my 1911s. I like single action only guns like this one because of their inherent accuracy from their light trigger press and reduced movement advantage. The slide was very easy for me to rack and the felt recoil and muzzle rise were very manageable. The stainless steel slide and frame really helped. Also, the high-swept beavertail allowed me to grip the gun high for better control. I really like the short reset and short and soft trigger. The mags were steel and held 16 rounds. I liked the one extra round as compared with a lot of similar full-size guns with 15 or so. It did not have an accessory rail, but I liked the rounded and smooth lines without it. This was the only glaring negative for me, but not one that would be at the top of my con list. Below I will get into my evaluation factors more and my opinions for each of the criteria, after my range testing of the 75 B SA pistol. This CZ 75 B SA impressed me as a very accurate and reliable (with the limited 200 rounds I fired) home defense and personal protection gun. But, I do think it is too heavy for a concealed carry gun. After initially cleaning the gun, I decided to shoot it at two of my usual test distances of 7 and 10 yards. My first 16 rounds fired rapid fire with this 75 B SA and the Sig Elite Ball FMJ at 7 yards and at 10 yards, all hit in a nice 2.50″ group for this old Mr. Magoo with visual impairment. These target hits were great for Magoo and me for close-up self-defense encounters. BUT, shoot it for yourself to make your own decisions, based on your abilities, goals, traits, proficiency, and purpose. You will be surprised at how accurate it is. Below are my first hits for the 75 B SA at 10 yards. The Accuracy of the 75 B SA with its 4.6″ barrel, short and soft trigger was very good for personal protection distances of 5, 7, 10, and 20 yards. Its heavy weight, long barrel, beavertail, and excellent trigger helped its accuracy. I really enjoyed shooting the gun. I want to fire more than only 200 rounds with this gun before I make a decision about using it for home or personal defense. I liked the crisp and smooth trigger. The 4.5# trigger press was great, short and comfortable. It definitely met my personal preference press range and criterion and helped my accuracy. The quality-made stainless steel slide and barrel looked good and contributed to accuracy. I used my Modified-Isosceles Stance, a two-handed grip, when I shot the gun. The Trigger Press averaged 4.50 pounds with 10 readings from my Lyman Electronic Trigger Pull Gauge. I was impressed. This was certainly acceptable and within my criterion limit for my press range for my personal protection guns and my single action guns. Given the only 200 rounds I fired with it, this press was great for me. It will probably improve even more over time after more break-in and getting 500 rounds or more through it. I prefer that my personal protection guns have a max. of 6.5 pounds press or so, preferably 4.5 to 5# for my carry guns, since I am use to single-action guns and cocked and locked carry. So for me this press is great. This is very much personal preference. I like the smooth trigger press and short reset. This classic gun’s Trigger has a very identifiable click and the short reset point was easy to feel. I liked the crisp quality feel of the short takeup and positive trigger reset. I experienced no stacking in the press weight and the trigger was not gritty at all. My shots were consistent each time and I could easily recognize both the tacticle and audible reset point. This classic has a proven and very nice trigger. The 4.60-inch length steel, hammer-forged Barrel of this full-size gun and its beavertail were nice and helped me control muzzle flip and felt recoil. My gunsmith friends tell me that the cold hammer-forged process hardens the barrel’s steel causing a very durable and long-lasting barrel. It also leaves a very smooth and consistent surface on the inside of the barrel that helps accuracy. The stainless steel barrel was high quality and will be very durable. Although the full-size 4.6″ barrel was longer, I was anxious to carry it because I liked its performance so much. The length did not affect carrying it as much as the gun’s weight. This all steel gun is heavy at almost 40 ounces with ammo in the mag. So, I have to carry it for 10 days or so to see how the weight is for carry. This barrel length contributes to good balance, handled & pointed well, was very accurate, and I had no feeding problems whatsoever. In my opinion, this gun would do very well for home defense, competition, recreational shooting, but probably not for carry. 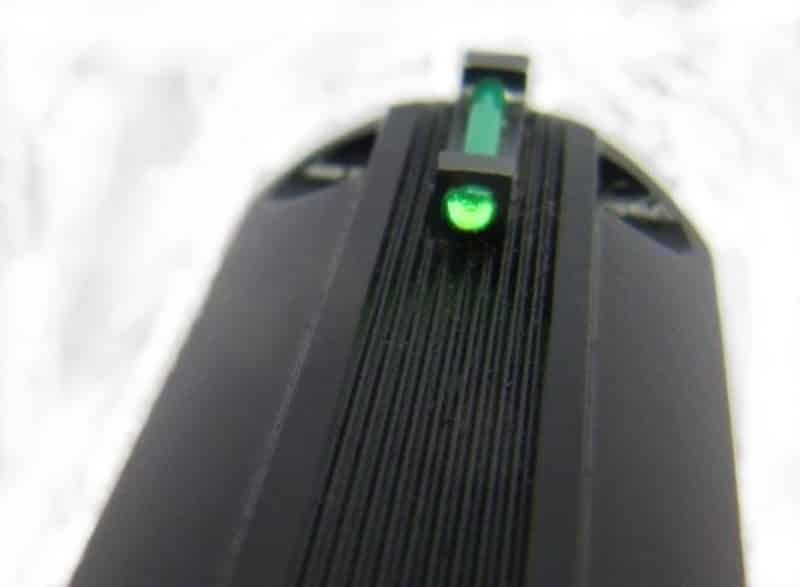 The Fiber Optic Front Sight in Bright Green was great for my color-blind and failing eyes. The standard sights were fine, but the optional green fiber optic really stood out for me. While the standard sights were acceptable, given my eye problems it was worth it for the optional front sight. The almost 40 ounce loaded weight of the 75 B SA was heavy and although it was so accurate, it is not optimal for carry. But it is very acceptable for range use, competition, and home defense.You must make your own tradeoffs, especially among the added weight and stability for accuracy and better felt recoil, etc. I definitely would use this gun for home defense, because the many pros strongly outweigh the weight factor. Also, it would work well for my International Defensive Pistol Association (IDPA) shoots. I really enjoyed shooting the CZ 75 B SA and it made me look good because it was so accurate. I understand why it is a classic and so well respected among law enforcement and competition circles. It is a very well built, all-steel gun. Plus, it was so comfortable in my hand. I really like and prefer the 9mm caliber for my main home defense and personal protection gun. I enjoy practicing with the 9mm, since it is not snappy, the recoil does not bother me so much, and 9mm ammo is less expensive than some other carry rounds. This 75 B SA pistol digested the ammo well without a single malfunction or stoppage. There were two steel mags included, both 16-rounders, but without round witness holes. I liked their high capacity and they were very sturdy and well made. It would be nice to have a third mag included. I believe for almost ALL uses a shooter should have at least 3 mags minimum on hand and included, to save up front expense for buying another and for proper defense. I understand that the added cost and the goal of keeping costs down are factors. I had no feeding problems with the ammo and the mags ejected freely and worked well. The Ergonomics of the 75 B SA are excellent. The upswept Beavertail helps get your hand positioned high at the very top of the backstrap for better recoil control. The grip angle is just right for me and allows a lower bore axis. It felt solid and very good in my medium-sized hands and the grip texturing was just right when I fired the 200 rounds. I was able to easily reach all the controls without changing my grip. The extended magazine release was easy to reach and operate, with the mag releasing freely. The gun is not hard on the eyes either, but some say who cares. While not a major or top factor, appearance of quality is a factor. The smooth, contured edges, rounded trigger guard of ample size, and grip helped me with a comfortable and solid-feeling grip. It fit my hand very well and I liked that the 75 B SA had an ambidextrous manual thumb safety so I could carry it cocked and locked. The 75 B SA is very easy to disassemble. The slide release acts as the takedown lever. So, lineup the two takedown lines, press out the slide release, and push the slide forward and off. Easy! As always, I disassembled, lubed, cleaned, and re-assembled the pistol before I shot it. I did NOT have to press the trigger to disassemble it and it was quick and very easy to takedown without using any tools. This gun has a lot of safety features like a firing pin block and the twin thumb safeties. The gun does not come with a holster like some guns, but there are several available to fit it. The 75 BSA does come with two high-quality, steel 16-round mags. The superior quality build and materials help ensure a long useful life, but it does come with a Lifetime warranty. I recommend this CZ 75 B SA for definite consideration as your home defense, competition, and/or fun recreational range gun. You even might want to consider it as your concealed carry gun after you gain familiarity with it, but it is a heavy gun to regularly carry. I am impressed with its accuracy and reliability right out of the box. And I like its soft and short trigger press. The heavy all-steel weight does help a lot with very manageable felt recoil and muzzle flip. While there are some less expensive guns on the market, this one to me is reasonably priced for what you get. I believe that you do usually get what you pay for. I bought this gun on my own at retail price. But you decide for yourself, based on your criteria and objective, how you will primarily use the gun, what features are important to you, which ones you are willing to pay for, then try the gun. Then critically evaluate the gun yourself per your criteria, purpose, and skills with standard drills, with various ammo types and brands, over an extended break-in period of about 500 rounds. Just for your information, some readers and students have requested I review the new CZ P-10 Compact soon, so the manufacturer has promised to send me one. So looking forward to helping folks with my review of it, as some will be released this month. Stay tuned. Continued Success and Be Safe Friends! © 2017 Col Benjamin Findley. All Rights Reserved. This article may not be reprinted or reproduced in whole or in part by mechanical means, photocopying, electronic reproduction, scanning, or any other means without prior written permission. or copyright information, contact Col Ben Findley at [email protected].